This section is ideal for professional astrologers and students, who are pursuing Indian astrology. This section includes a wide range of astrology software which help you prepare detailed horoscope charts and calculations with the highest level of precision, accuracy and reliability. Using these software, you can also find several tools that are helpful for astrologers in their daily routine. This section is ideal for personal users, who are interested to know their personal astrology. It includes astrology software ideal for those who would like to explore Indian astrology and prepare authentic astrology reports. If you are fascinated by the science of vedic astrology and curious to know what it has in store for you and your loved ones, then these astrology software give you the right way. This section is ideal for business users, who want to start offering astrology services on a commercial basis. Our Vedic astrology software generates horoscope predictions in various languages. You can setup your own astrology business center with the help of our unique range of astrology software. Developed & refined over more than 3 decades, our software are widely used by many business owners. This section is helpful for all kinds of users who are interested to explore the power of Vedic astrology by using several free astrology software, free mobile apps, free astrology tools, widgets etc. "The digital avatars of Jyotisha powered by Astro-Vision have spread awareness and are ideal to today's fast paced life..."
"I have been using Astro-Vision mobile application for the past two years. It is very simple, useful and accurate..."
"In older days, without checking panchangam, people didn't even stepped out of their homes. But in today's world..."
"Astro-Vision Futuretech is the number one company providing astrological reports, which are very accurate..."
Astro-Vision LifeSign Star is a variant of LifeSign 14.0, provides horoscope calculations and predictions. Suitable for professional astrologers. Available in 9 languages. AstroStar is an Astrology Combo pack from Astro-Vision with LifeSign Star, YearGuide, SoulMate and StarClock VX for professional astrologers and business users. Available in 9 languages. 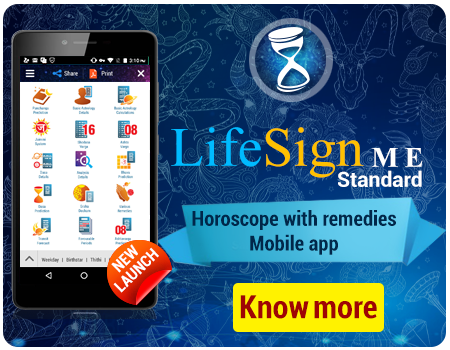 Astro-Vision launches the LifeSign upgraded mobile version is LifeSign ME Standard, the professional mobile app for horoscope with remedies, available in Android mobile and tablet. Get the best quote with us today!. Get the utimate horoscope software with detailed horoscope calculations & remedies based on Vedic astrology. Used by astrologers all over the world. StarClock ME Ultimate is the most advanced mobile astrology software available in Android and Java.Includes Horoscope Matching and lots more. Get the most comprehensive set of Astrology Software Suite and start getting more revenue from your business right now! Available in various Indian languages. Astro-Vision StarClock Plus is a perfect jyotish companion for astrologers & astrology students; Provides precise in-depth astrology calculations & muhurtha. Get MingSign, Chinese Astrology Software from Astro-Vision. Provides annual forecast and predicts your personality, relations and various aspects of life.